Cranes are a family, Gruidae, of large, long-legged and long-necked birds in the group Gruiformes. There are fifteen species of crane in four genera. Unlike the similar-looking but unrelated herons, cranes fly with necks outstretched, not pulled back. Cranes live on all continents except Antarctica and South America. They are opportunistic feeders that change their diet according to the season and their own nutrient requirements. They eat a range of items from suitably sized small rodents, fish, amphibians, and insects to grain, berries, and plants. Cranes construct platform nests in shallow water, and typically lay two eggs at a time. Both parents help to rear the young, which remain with them until the next breeding season. Most species of cranes have been affected by human activities and are at the least classified as threatened, if not critically endangered. The plight of the whooping cranes of North America inspired some of the first US legislation to protect endangered species. The cranes are large to very large birds, including the world's tallest flying bird. 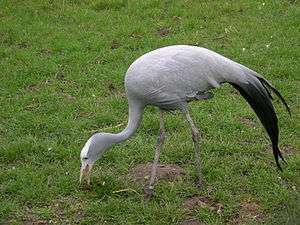 They range in size from the demoiselle crane, which measures 90 cm (35 in) in length, to the sarus crane, which can be up to 176 cm (69 in), although the heaviest is the red-crowned crane, which can weigh 12 kg (26 lb) prior to migrating. They are long-legged and long-necked birds with streamlined bodies and large rounded wings. The males and females do not vary in external appearance, but on average males tend to be slightly larger than females. 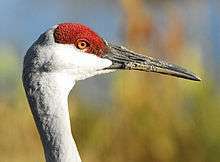 The plumage of the cranes varies by habitat. Species inhabiting vast open wetlands tend to have more white in the plumage than do species that inhabit smaller wetlands or forested habitats, which tend to be more grey. These white species are also generally larger. The smaller size and colour of the forest species is thought to help them maintain a less conspicuous profile while nesting; two of these species (the common and sandhill cranes) also daub their feathers with mud to further hide while nesting. Most species of crane have some areas of bare skin on the face; the only two exceptions are the blue and demoiselle cranes. This skin is used in communication with other cranes, and can be expanded by contracting and relaxing muscles, and change the intensity of colour. Feathers on the head can be moved and erected in the blue, wattled and demoiselle cranes for signalling as well. Also important to communication is the position and length of the trachea. In the two crowned-cranes the trachea is shorter and only slightly impressed upon the bone of the sternum, whereas the trachea of the other species is longer and penetrates the sternum. In some species the entire sternum is fused to the bony plates of the trachea, and this helps amplify the crane's calls, allowing them to carry for several kilometres. The cranes have a cosmopolitan distribution, occurring across most of the world continents. They are absent from Antarctica and, mysteriously, South America. East Asia is the centre of crane diversity, with eight species, followed by Africa, which holds five resident species and wintering populations of a sixth. Australia, Europe and North America have two species. Of the four genera of crane, two, Balearica (two species) and Bugeranus (one species) are entirely restricted to Africa, and the third Anthropoides has one entirely African species and one species that is found in Africa, Asia and Europe. The remaining genus, Grus, contains the most species and is the most widespread genus, although only a single species occurs in Africa as a wintering migrant. Most species of crane are dependent on wetlands and require large areas of open space. Most species of crane nest in shallow wetlands. Some species nest in wetlands but move their chicks up onto grasslands to feed (while returning to wetlands at night), whereas others remain in wetlands for the entirety of the breeding season. Even the two species of Anthropoides crane, which may nest and feed in grasslands (or even arid grasslands or deserts) require weedlands for roosting in during the night. The only two species that do not always roost in wetlands are the two African crowned-cranes (Balearica), which are the only cranes to roost in trees. Some crane species are sedentary, remaining in the same area throughout the year, others are highly migratory, travelling thousands of kilometres each year from their breeding sites. A few species have both migratory and sedentary populations. The cranes are diurnal birds that vary in their sociality by season. During the breeding season they are territorial and usually remain on their territory all the time. In contrast in the non-breeding season they tend to be gregarious, forming large flocks to roost, socialise and in some species feed. Species that feed predominately on vegetable matter in the non-breeding season feed in flocks to do so, whereas those that feed on animals will usually feed in family groups, joining flocks only during resting periods, or in preparation for travel during migration. Large aggregations of cranes are important for safety when resting and also as places for young unmated birds to meet others. Cranes are highly vocal and have a large vocabulary of specialized calls. The vocabulary begins soon after hatching with low, purring contact calls for maintaining contact with their parents, as well as food begging calls. Other calls used as chicks include alarm calls and "flight intention" calls, both of which are maintained into adulthood. The cranes' duet calls are most impressive. They can be used for individual recognition (see below external link). The cranes as a family consume a wide range of food, ranging from animal to plant matter. When feeding on land they consume seeds, leaves, nuts and acorns, berries, fruit, insects, worms, snails, small reptiles, mammals and birds. In wetlands roots, rhizomes, tubers and other parts of emergent plants, other molluscs, small fish and amphibians are also consumed as well. The exact composition of the diet varies by location, season and availability. Within the wide range of items consumed there are some patterns; the shorter-billed species usually feed in drier uplands while the longer-billed species feed in wetlands. Cranes employ different foraging techniques for different food types. Tubers and rhizomes are dug for and a crane digging for them will remain in place for some time digging and then expanding a hole to find them. In contrast both to this and the stationary wait and watch hunting methods employed by many herons, they forage for insects and animal prey by slowly moving forwards with their heads lowered and probing with their bills. Where more than one species of crane exists in a locality, each species will adopt separate niches in order to minimise competition and niche overlap. At one important lake in Jiangxi Province in China the Siberian cranes feed on the mudflats and in shallow water, the white-naped cranes on the wetland borders, the hooded cranes on sedge meadows and the last two species also feed on the agricultural fields along with the common cranes. Cranes are perennially monogamous breeders, establishing long-term pair bonds that may last the lifetime of the birds. Pair bonds begin to form in the second or third years of life, but it may be several years before the first successful breeding season. Initial breeding attempts often fail, and in many cases newer pair bonds will dissolve (divorce) after unsuccessful breeding attempts. Pairs that are repeatedly successful at breeding will remain together for as long as they continue to do so. In a study of sandhill cranes in Florida, seven out of the 22 pairs studied remained together for an 11-year period. Of the pairs that separated 53% were due to the death of one of the pair, 18% due to divorce and the fate of 29% of pairs were unknown. Similar results had been found by acoustic monitoring (sonography / frequency analysis of duett and guard calls) in 3 breeding areas of common cranes in Germany over 10 years. Cranes are territorial and generally seasonal breeders. Seasonality varies both between and within species, dependent on local conditions. Migratory species begin breeding upon reaching their summer breeding grounds, between April and June. The breeding season of tropical species, however, is usually timed to coincide with the wet or monsoon seasons. Territory sizes also vary depending on location. Tropical species can maintain very small territories, for example sarus cranes in India can breed on territories as small as one hectare where the area is of sufficient quality and disturbance by humans is minimised. 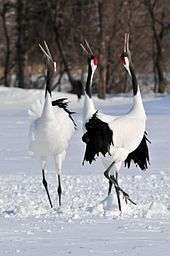 In contrast red-crowned crane territories may require 500 hectares, and pairs may defend even larger territories than that, up to several thousand hectares. Territory defence is usually performed by the male. Because of this females are much less likely to retain the territory than males in the event of the death of a partner. The fossil record of cranes leaves much to be desired. Apparently, the subfamilies were well distinct by the Late Eocene (around 35 mya). The present genera are apparently some 20 mya old. Biogeography of known fossil and the living taxa of cranes suggests that the group is probably of (Laurasian?) Old World origin. The extant diversity at the genus level is centered on (eastern) Africa, making it all the more regrettable that no decent fossil record exists from there. On the other hand, it is peculiar that numerous fossils of Ciconiiformes are documented from there; these birds presumably shared much of their habitat with cranes back then already. Probalearica (Late Oligocene? – Middle Pliocene of Florida, US, France?, Moldavia and Mongolia) – A nomen dubium? The supposed Grus prentici is not a true crane; it was eventually placed in the genus Paragrus. 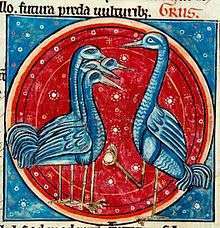 Illustration in the English manuscript Harley Bestiary (13th century) of the legend of the vigilant cranes. At night cranes take turns keeping watch for enemies. 1909 illustration of the fable of the geese and the cranes, from Aesop's Fables. The geese and the cranes were feeding in the same meadow, when a birdcatcher came to ensnare them in his nets. The cranes, being light of wing, fled away at his approach, while the geese, being slower of flight and heavier in their bodies, were captured. The cranes' beauty and their spectacular mating dances have made them highly symbolic birds in many cultures with records dating back to ancient times. Crane mythology is widely spread and can be found in areas such as the India, Aegean, South Arabia, China, Korea, Japan and in the Native American cultures of North America. In northern Hokkaidō, the women of the Ainu people performed a crane dance that was captured in 1908 in a photograph by Arnold Genthe. In Korea, a crane dance has been performed in the courtyard of the Tongdosa Temple since the Silla Dynasty (646 CE). The Sanskrit epic poet Valmiki was inspired to write the first śloka couplet by the pathos of seeing a male sarus crane shot while mating. In Mecca, in pre-Islamic South Arabia, Allāt, Uzza, and Manāt were believed to be the three chief goddesses of Mecca, they were called the "three exalted cranes" (gharaniq, an obscure word on which 'crane' is the usual gloss). See The Satanic Verses for the best-known story regarding these three goddesses. In China, several styles of kung fu take inspiration from the movements of cranes in the wild, the most famous of these styles being Wing Chun, Hung Gar (tiger crane), and the Shaolin Five Animals style of fighting. Crane movements are well known for their fluidity and grace. The Greek for crane is Γερανος (Geranos), which gives us the cranesbill, or hardy geranium. The crane was a bird of omen. In the tale of Ibycus and the cranes, a thief attacked Ibycus (a poet of the 6th century BCE) and left him for dead. Ibycus called to a flock of passing cranes, who followed the attacker to a theater and hovered over him until, stricken with guilt, he confessed to the crime. Pliny the Elder wrote that cranes would appoint one of their number to stand guard while they slept. The sentry would hold a stone in its claw, so that if it fell asleep it would drop the stone and waken. A crane holding a stone in its claw is a well-known symbol in heraldry, and is known as a crane in its vigilance. Greek and Roman myths often portrayed the dance of cranes as a love of joy and a celebration of life, and the crane was often associated with both Apollo and Hephaestus. Throughout Asia, the crane is a symbol of happiness and eternal youth. In Japan, the crane is one of the mystical or holy creatures (others include the dragon and the tortoise) and symbolizes good fortune and longevity because of its fabled life span of a thousand years. The crane is a favourite subject of the tradition of origami or paper folding. An ancient Japanese legend promises that anyone who folds a thousand origami cranes will be granted a wish by a crane. After World War II, the crane came to symbolize peace and the innocent victims of war through the story of schoolgirl Sadako Sasaki and her thousand origami cranes. Suffering from leukemia as a result of the atomic bombing of Hiroshima and knowing she was dying, she undertook to make a thousand origami cranes before her death at the age of 12. After her death, she became internationally recognised as a symbol of the innocent victims of war and remains a heroine to many Japanese girls. Pine, Plum and Cranes, 1759, by Shen Quan (1682—1760). Hanging scroll, ink and colour on silk. The Palace Museum, Beijing. The "Turtle Carrying Crane on its Back" statue in Văn Miếu (Temple of Literature) in Hà Nội, Vietnam. Dwarves fighting cranes in northern Sweden, a 16th-century drawing by Olaus Magnus. ↑ Archibald, George W. (1991). Forshaw, Joseph, ed. Encyclopaedia of Animals: Birds. London: Merehurst Press. pp. 95–96. ISBN 1-85391-186-0. 1 2 3 4 5 6 7 8 9 10 Archibald, George; Meine, Curt (1996). "Family Gruidae (Cranes)". In del Hoyo, Josep; Elliott, Andrew; Sargatal, Jordi. Handbook of the Birds of the World. Volume 3, Hoatzin to Auks. Barcelona: Lynx Edicions. pp. 60–81. ISBN 84-87334-20-2. ↑ Gaunt, Abbot; Sandra L. L. Gaunt; Henry D. Prange; Jeremy S. Wasser (1987). "The effects of tracheal coiling on the vocalizations of cranes (Aves; Gruidae)". Journal of Comparative Physiology A. 161 (1): 43–58. doi:10.1007/BF00609454. ↑ "craneworld.de". craneworld.de. Retrieved 2012-07-29. 1 2 Nesbitt, Stephen A. (1989). "The Significance of Mate Loss in Florida Sandhill Cranes" (PDF). Wilson Bulletin. 101 (4): 648–651. ↑ Wessling, B. (2003). "Acoustic individual monitoring over several years (mainly Common Crane and Whooping Crane)". Craneworld.de. ↑ Miller, Alden H.; Sibley, Charles G. (1942). "A New Species of Crane from the Pliocene of California" (PDF). Condor. 44 (3): 126–127. doi:10.2307/1364260. ↑ Leslie, J. (1998). "A bird bereaved: The identity and significance of Valmiki's kraunca". Journal of Indian Philosophy. 26 (5): 455–487. doi:10.1023/A:1004335910775. ↑ Hammer, Niels (2009). "Why Sārus Cranes epitomize Karuṇarasa in the Rāmāyaṇa". Journal of the Royal Asiatic Society of Great Britain & Ireland. (Third Series). 19 (2): 187–211. doi:10.1017/S1356186308009334. ↑ "The Internet Classics Archive | The History of Animals by Aristotle". Classics.mit.edu. Retrieved 2012-07-29.